September 17, 2015 Posted in Drinks, Food, Mains, Starters. Sushi is one of my favourite dishes and I also like to prepare it myself. I like sushi which have lots of fillings and not that much rice. 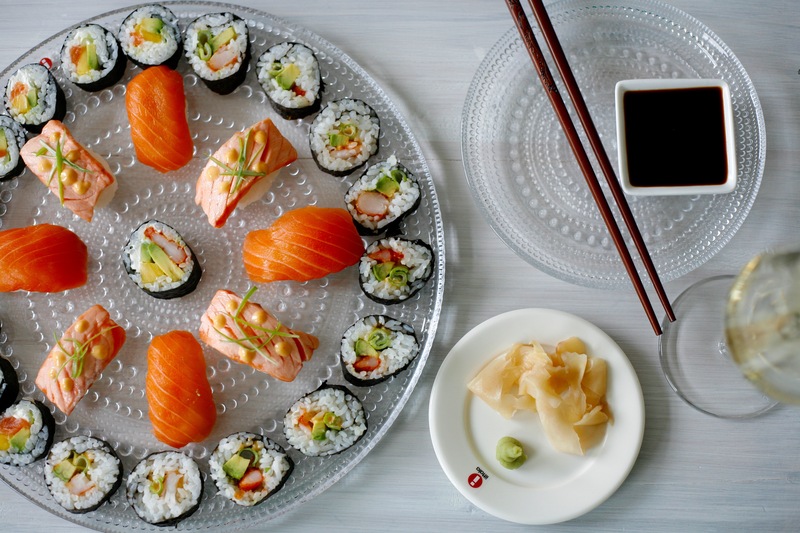 Recently my favourite maki-combos have been: spring onion, salmon, mango, cream cheese and avocado and another one has been scampi, mango, spring onion and chili mayonnaise. I also lovelovelove nigiris and prefer salmon with those. It is said that boiling sushi rice is one of the most difficult steps when preparing sushi. Actually it is not that difficult if you just follow steps carefully. Rinse sushi rise with a cold water so long time that water is clear. Let the rice dry in a sieve about 20 minutes. Add water to a kettle and add rice. Cover kettle with a lid and bring water to a boil and then lower temperature almost to zero. Let the rice simmer for 20 minutes. Add water if needed. After 20 minutes move kettle from stove but let rice to rest under a cover about 15 minutes. Do not open the cover that you keep water vapor inside. When the rice is resting make the sauce (just mix all ingredient together and your sauce is ready) and chop your fillings to wanted size. Now place the rice to big plate or bowl and let it cool down. You can carefully lift rice so it cools down quickly. When the rise has cool down you can start to fill sushis. Look from the picture below how. You can use cold water to glue end of seaweed to its place. 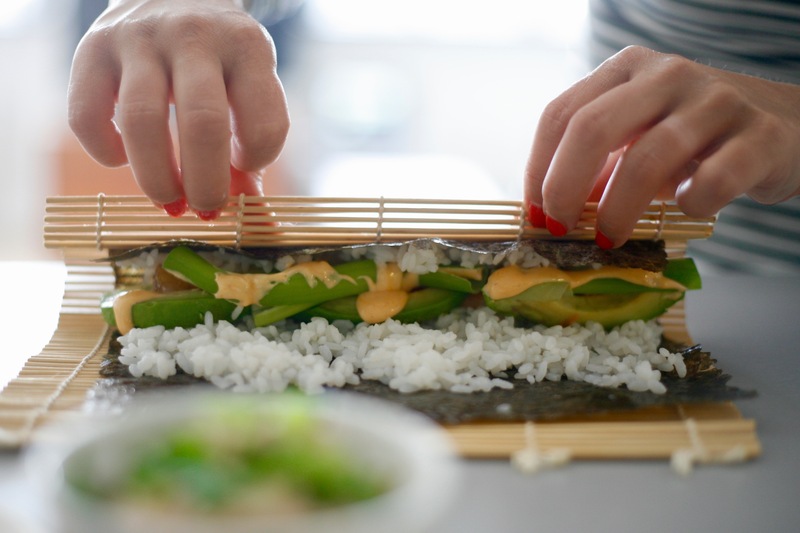 Use sharp knife when slicing maki rolls so that they will keep their form. When making nigiris just form oval “rice balls” from rice, add a bit of wasabi on top and cover with salmon slice. Serve with soya sauce, wasabi and pickled ginger. Tip: Dry beer (Asahi super dry) or white wine Kung Fu Girl Riesling goes quite nice with sushi. Next: Next post: Pizza Friday?